Ah, those were the days. There were quite a few reasons those materials turned out as they did, including the fact that we created them based on real-life teaching experience of several instructors going back almost a decade. Thanks, Ivan, waiting for another feature video. Using different RD per vrf per pe would also provide the same benefits? RD-per-VRF solves the "load balancing beyond RR" problem (which is also solved with AddPath). In this scenario it won't help - the PE router with the backup link will import IBGP VPNv4 route with a different RD into its BGP table (based on RT settings), select it as the best, and thus stop advertising its VRF EBGP route to IBGP peers. Thanks for correcting me. I have learned a ton from your posts and mpls books. The fail over solution you have outlined in this post is my go to solution /w communities. Eager to start labbing this and improving my offering. 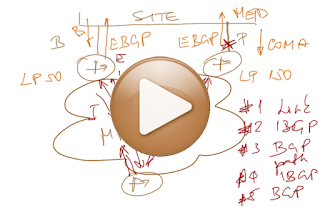 Would you please also give your advise on how the described feature inter-operates/integrates with BGP Multipath. My view is that when BGP Multipath is enabled in load-balancing scenario, one doesn't need any additional tweaks like "BGP Best external", could you please share your expert view on that? BGP Multipath does not work when the two external BGP routes are not (nearly) identical, which they shouldn't be in primary/backup scenarios.